Theo’s Timber are internal door casings and Par Redwood suppliers. This is joinery quality Scandinavian deal. Solid knots allowed in grade, plained all round, square 4 sides, normally random lengths. 1) An internal door casing: – 2 legs and a head to suit a 2ft 9” (838mm) or 2ft 6” (762mm) internal door in various widths. 2) We also do fire check casings, where the customer gives the brick dimension and opening in height and width, and we produce a casing to suit. The customer informs us if it needs to have any fire regulations at all. Our door casing package includes a top part and two doorposts. The three parts are fitted together after purchase. Our head comes in large enough size to fit any door length. Therefore, we advise you to have the accurate measurement of the intended door casing area before you make an order. The information helps in designing a package that will perfectly fit as intended. 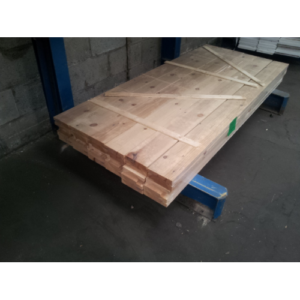 We also offer delivery to ensure the casing arrives at the destination in complete form as it was developed. Fixing of our internal door casings takes a straightforward process. All you need is to assemble the three parts. We design them with rebates and attachable parts on the corners to be matched to ensure that they connect well when fixed together. The rebating eases the work of fixing and aligning your door casing parts. First, you will have to hold each jamb at a time with the top part. After aligning the first one, you can them use relative size nails that will fit well. Our door casing package is made from the best wool that’s hard to break or deform during nail penetration and hammering. We recommend you ensure the two parts are marching before the nails go through to attach the parts on the entrance space. The confirmation is to guarantee that you don’t remove the nail to adjust. After fixing the head with the two jambs and nailing the head, it’s essential to ensure that the lower part space marches the length of the head part before nailing the frames permanently. To achieve this, we require the use of a tape measure and two light wood materials. Then take the head length measurement. We then ensure that each corner is at 90 degrees. We recommend that the right angle corner can be made using specialised tools for that. In case there’s none, any perfect object with rectangular shape can be used where casing maybe just for one door. Fix the two light wood materials temporarily to ensure the angles don’t twist. We then require measurements to be confirmed on the down part where the two jambs extend. After ensuring the internal door casings are well aligned and in perfect shape, we complete the process by nailing the jambs permanently. Click on the links below for further information where you can log in to see prices as well as making an enquiry to order the products. Alternatively, please call us on 0161 834 6789 or send an enquiry to theos@theostimber.co.uk. We would be happy to assist you with any requirements.